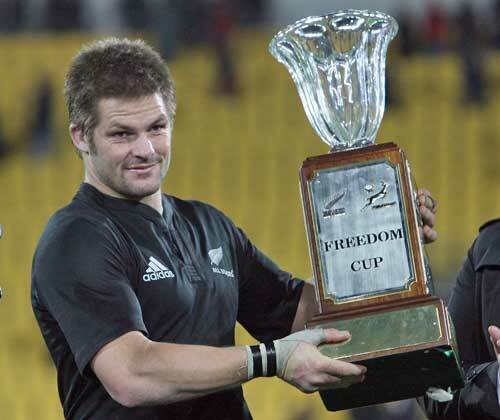 South Africa accused referee Alain Rolland giving New Zealand captain Richie McCaw special treatment in the wake of their 31-17 Tri-Nations defeat in Wellington. Irish official Rolland dominated much of the talk after the game having shown Springboks lock Danie Rossouw yellow card in the opening moments of the game for apparently kicking out at McCaw while winger Jean de Villiers was today suspended for two weeks by the Sanzar judiciary for a dangerous lifting tackle on opposite number Rene Ranger. The match sparked recollections of the teams' 2007 Tri-Nations Test in Christchurch three years ago when Springboks flanker Pedrie Wannenburg was sinbinned and his stand-in skipper Johann Muller subsequently described McCaw as a protected species. "I suppose if it had been my first year of playing against the All Blacks I'd be surprised," Smit said of McCaw's survival yesterday. "But it's not my first year." South Africa coach Peter de Villiers took it further, suggesting his team may have to resort to cheating to match New Zealand's methods. "You hop on planes, you go right around the world to go to conferences and there is emphasis is on certain laws," he said. "We've played now six games and in six games we've had six different kinds of players on the ground (rulings). I don't like to prepare guys to cheat and it seems to me the only way going forward if you want to be on top of those kind of things." All Blacks counterpart Graham Henry took umbrage at the comments, repeating his claim that Rolland is a world class official. "He allowed the contest which is important. He penalised guys who weren't legal at that contest." McCaw admitted he was guilty of infringing when his team were under pressure but rejected the suggestion that Rossouw was unlucky to spend 10 minutes sidelined in his 50th Test. "I guess he got done for lashing out, it was probably a bit stupid really," McCaw said. However, Smit's main concern was his own team's lack of discipline following the fallout from the first Test in Auckland a week earlier when lock Bakkies Botha was yellow-carded and incurred a nine-week ban for separate incidents. Smit said offenders incurred additional sanctions within the team in a bid to keep discipline as a priority. "It's certainly something that has been discussed at length for a number of years, especially with the image we had if you think back probably pre-2003 and the work that we did to clean that up," he said. "It's certainly not the sort of question I want to be answering 6-7 years later. Discipline is vital and if guys are seen to be stepping outside of the team, they do get dealt with internally." Veteran lock Victor Matfield was also concerned about the refereeing of the breakdown, adding, "I felt we couldn't get quick ball. In the Super 14 they got the tackler away much quicker and that's not happening at the moment. But again we want to adapt to the referee and we didn't do it tonight. We've had them [northern hemisphere referees] two weeks now and in the Super 14 it was definitely quicker." The big lock also lamented the fact that, for the second week in a row, the Springboks had been forced to play with 14 men. "Danie was very surprised by the yellow. He still doesn't know exactly what he did wrong. We'll have to have a look at it," Matfield said. "Against the All Blacks you can't play with 14 men, especially at the beginning," a frustrated Matfield said. "It gives them a lot of momentum. It gives them belief in the game and puts you under pressure."